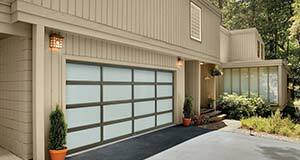 Your garage door says a lot about your home. It’s usually the most visible feature of your home from the street. As such, a new garage door adds curb appeal and value. Even more important than aesthetics, though, is safety. The garage door is the largest and heaviest moving part of your home. It needs to be properly installed, inspected and serviced in order to remain safe. With over 25 years of experience in the industry, Sequoia Door can install or repair just about any type of residential garage door and operator. We’ll help you select a new garage door that best suits your home and budget and we can inspect, service and repair existing doors. At Sequoia Door, we are proud to install Amarr Doors. Whether you are looking for a steel or wood door, sectional or carriage house style, with windows or without, we can help you choose the door that is right for your home and your budget. Call us today at (559) 562-2804 to schedule a free estimate for a new door. But what about repairs? Yes, we do those too. Sequoia Door has fixed just about every type of door failure and damage. Whether your door is making a peculiar noise or just not working at all, Sequoia Door can troubleshoot the problem and make the appropriate repair—quickly and cost-effectively.